Josh is conducting his doctoral research in Copenhagen, funded through the Mortimer May Scholarship at Hertford College. He holds an MPhil in History and Philosophy of Science from Cambridge, where he conducted research on histories of domestication and experimental evolution research, the philosophy of biological individuality, and how historical field sciences, colonialism, and past agricultures have shaped contemporary conservation practices in the Pacific Northwest of North America. 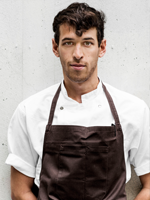 Prior to this, he worked in culinary research & development for four years with Nordic Food Lab, a non-profit organisation in Copenhagen that conducted open-source experimental research on taste and food diversity, such as with insects, wild plants, and fermentation techniques. He earned his BA in the Humanities at Yale where he studied literature, philosophy, and sustainable food systems. Josh follows the 'translated' fermentation practices of leading chefs and fermentors at three sites in Copenhagen (Restaurant noma, Restaurant Amass, and Empirical Spirits) who are combining traditional fermentation techniques from different cultures with Nordic raw materials to create foods that have never existed before. Their stated goal is solely the creation of new flavours; but based on how quickly and rhizomatically microbes reproduce and adapt to new environments, it is possible, if not probable, that these convivial experiments may be bringing new kinds of ecologies and even new organisms into being. Certainly they are creating new kinds of microbe-human relationships: using a combination of multispecies ethnography, metagenomic sequencing, and collaborative experiment, Josh traces how microbial and human collaborators are shaping each other's behaviours, bodies and appetites in emergent ways. His research intervenes in broader ongoing cross-disciplinary debates on domestication—a key concept for understanding human agency in the evolution of other organisms, and other organisms' agency in our own. Here, the lack of intention to produce hereditary change make these convivial fermentation experiments poised to contribute new insight to multispecies studies and domestication research—each, in their own way, concerned with how humans and non-humans make and remake each other in loopy, neverending ways. Evans, J. (2018) Microbial Landscapes. Prospect Books, London. Food and Landscape: Proceedings of the Oxford Symposium of Food and Cookery 2017. Payne, C.L.R. and Evans, J. (2017) Nested Houses: Domestication dynamics in human–wasp relations in contemporary rural Japan. Journal of Ethnobiology and Ethnomedicine, 13(13). Müller, A., Evans, J., Payne, C. and Roberts, R. (2016) Entomophagy and Power. Journal of Insects for Food and Feed, 2: 121-136.